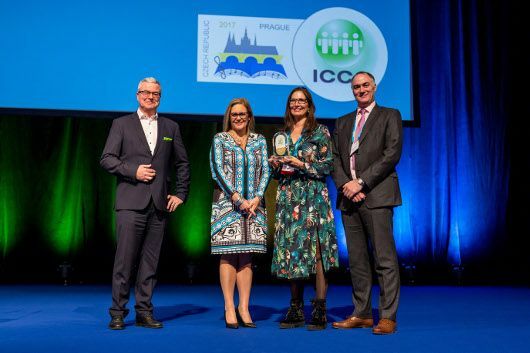 The award was handed over at the 56th ICCA Congress on 15 November in Prague. The other two finalists of the 2017 ICCA Best Marketing Award: International Convention Centre Sydney (ICC Sydney) and Shocklogic (UK). FMCCA is a relatively new player in the field. The conference centre opened its doors June 6th 2017 and is part of the ZOO Foundation, a place of animal welfare, nature conservation and science. A place from which the FMCCA derives its huge and quite remarkable social relevance and anchoring. The ‘A room with a zoo’ campaign, emphasizes the importance of Instant CSR through conservation. The global community and knowledge hub for the international association meetings industry ICCA – the International Congress and Convention Association – represents the world’s leading suppliers in handling, transporting and accommodating international meetings and events, and comprises over 1,000 member companies and organisations in almost 100 countries worldwide. This year’s ICCA Congress was the biggest ICCA “Congress on congresses” ever with 1278 attendees from 80 countries.